Ah ehm....yes, I'm apparently back! stuffs...but I decided at last to have a look here, as I missed a lot this place! I hope to submit other things on here and i hope to have the time to do it! ♦I love to make traditional drawings and sometimes change style! ♦I'm in love with my boyfriend Alessio, he is most important for me!! our anniversary is on 12 June!! 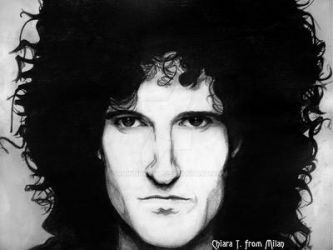 Queen, but in a particular way Brian May!! ♦I love play guitar and draws!! ♦I think that Montreux and London are very magnificent cities!!! Can you do my scuba diving badger from Massachusetts, Chuck? He's a anthropomorphic badger. He wears a full body scuba suit and he wears a vest. And he's a American badger, so you'll have to search up images of American badgers if you want want to draw Chuck the Badger. And I would like him scuba diving underwater. If not, that's OK. Thank you for the llama! Your art is all so wonderful! Keep up the amazing work! Hi! Just want to say you are super talented! I love your work! Hello, darling! I wish you a warm happy birthday and I hope you are having a great day! May all your dreams and wishes come true, and keep up the good work! Yes, I get inspiration by his song! you're welcome for the fav! !